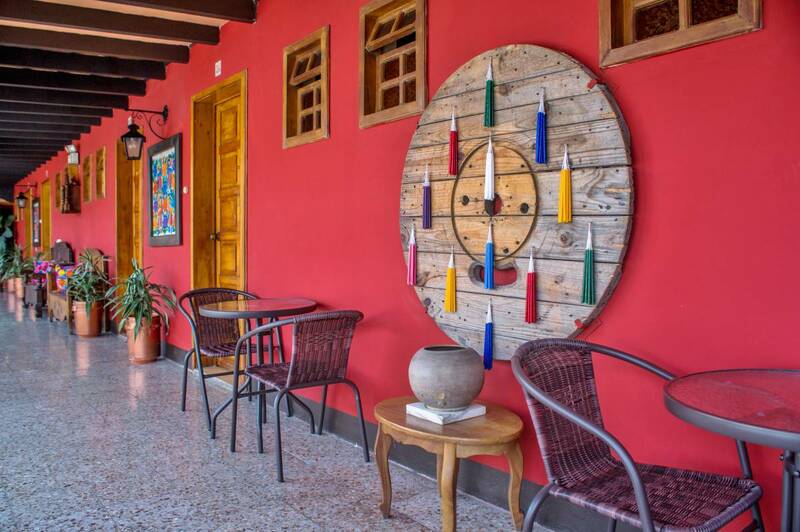 Great location budget hotel & hostel - only 3 short blocks from central park, close to the most important sites and shopping, in a very safe & quiet location in the heart of Antigua Guatemala. 29 large comfy rooms w/kitchenette. The hotel is even better now, as we just completely remodeled the hotel in Nov 2017. 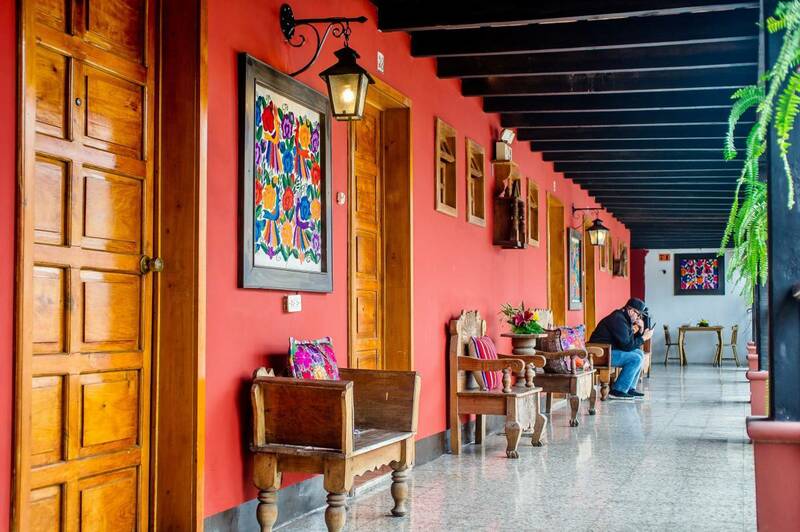 We offer 29 very comfortable & clean rooms, all with beautiful Guatemalan typical furniture & fabrics. All rooms have private bathroom, cable TV, Wi-fi & new anti-stress beds. We have different options for each need, all of them to make your stay pleasant and comfortable. If you are coming with little ones, we offer a pack-n-play baby bed for your use during your stay. There is a real friendly atmosphere and a since of being at home here. With many common areas in the hotels, you have the opportunity to meet many different & interesting people. In our properties group we offer 12 hotels, 1 hostel and 2 sets of vacation rental apartments: Three 4-star hotels (1 with suites, 1 with a swimming pool and spa, and 1 set in the colonial ruins of a historical convent), a three 3. 5-star hotel, three 3-star hotels, three 2. 5-star hotels. All of our hotels are within 4 blocks of each other and within 3 blocks of Antigua's beautiful central park. We have over 225 rooms and can accommodate over 750 people. So, we can accommodate large groups in one single hotel or very large groups between a few of our hotels. Even if your group is split between a few of our hotels, you would never be more than a 3 minute walk from the rest of your group, since our hotels are very close to each other and very centrally located to the central park of Antigua. Also, if your group is interested in meal plans, we can provide breakfast, lunch and dinner. 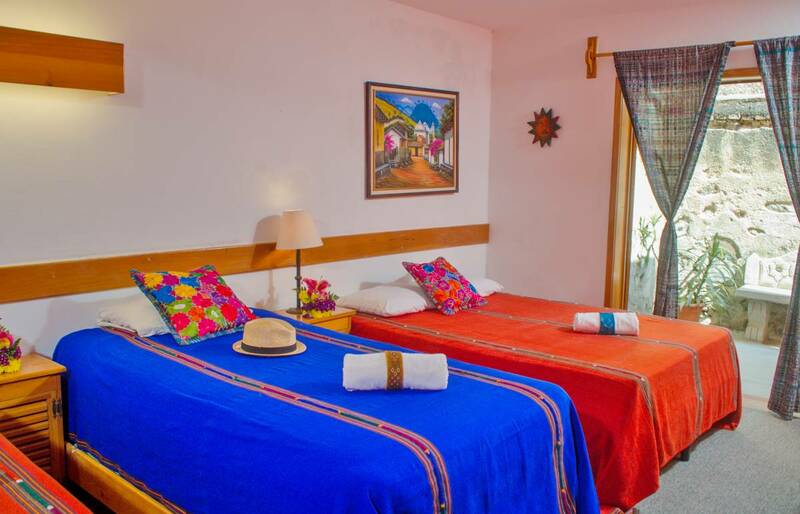 In Hotel Panchoy, we can offer single, double, triple or quad rooms with private bathrooms & kitchenettes. We offer all private & comfortable rooms, 29 rooms in all. 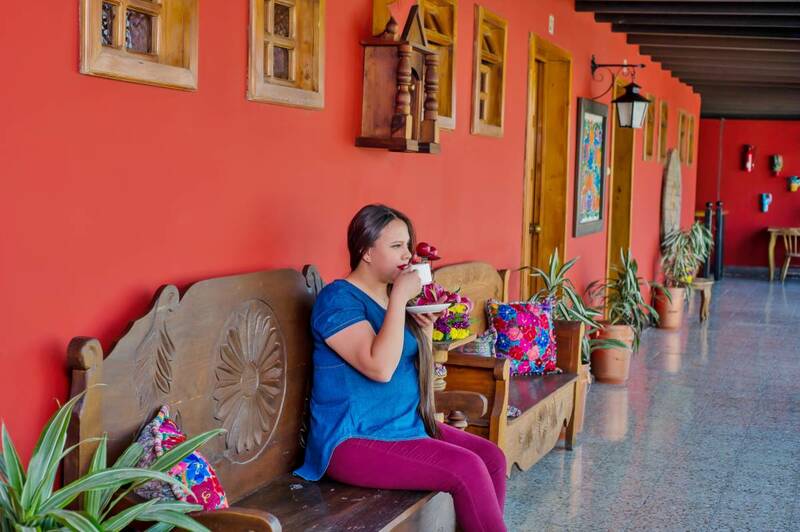 In Hotel Panchoy, we have a Travel Agency, in the hotel lobby we sell a great selection of coffees, beers, teas & snacks. We have beautiful large garden, large corridors with sitting areas. 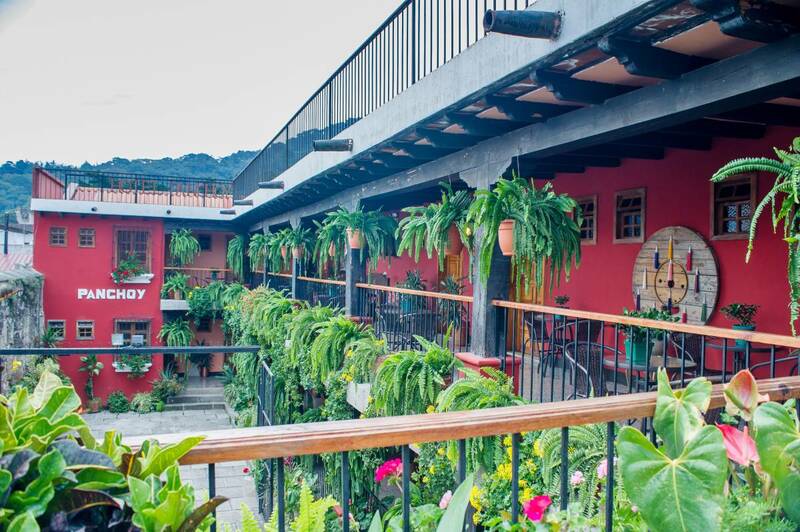 Also, we have a large terrace with spectacular volcano views & more lounging areas. We offer single, double, triple or quad rooms, with private bath & cable TV. Our Quad rooms include 2 double beds & 2 single beds. Our triple rooms have 2 double beds & 1 single bed. Our double rooms have 2 double beds. The hotel is located close to all the important sites, 3 blocks from the central park. With in 1 minute walk, there are historical sites, restaurants & shopping. If you are planning your own way, from Guatemala City airport, take a shuttle or drive to Antigua (45 minutes) via Calzada Roosevelt. Enter into Antigua on 3rd Calle, for Hotel Panchoy, turn left onto 2nd Ave, go 2 blocks & turn left onto 5th Calle, go 1 block & turn left onto 1st Ave. We are just half a block up at 1st Ave North #5A. We offer private airport pickup for $37. This price is for 1 to 3 hotel guest. For larger groups, it is $8 extra per person. To arrange this, please write us an email at hotelpanchoy@hotmail.